PageTiger is a cloud-based content management system for creating, publishing, and tracking custom interactive online content. The software is aimed at medium-sized, large, and global companies who need to lock all content to their brand guidelines. PageTiger includes a range of built-in content templates, which can be set to automatically match brand guidelines. With TigerDesign, users can add their own text, images, and video, and select from a variety of interactive elements, including links, downloads, surveys, tests, pop-up boxes, and more. Custom templates can be built from ready-designed pages, with users able to combine any number and type of pages. Users can also create their own templates from scratch, or have bespoke templates created on their behalf by PageTiger. Security settings can be added to content before it is published, to control access, and secure content weblinks can be accessed directly or embedded in websites or intranets. TigerGenius allows users to create TigerKits, which bundle all elements of a publication, such as a handbook, presentation, or magazine, into a customizable kit. Text, imagery, and security settings are all contained within the kit, and users can lock any individual element before authors are able to access the kit to ensure brand consistency. This enables the customization of content for different departments, divisions, or regions while maintaining a consistently-branded publication. Authors work through the kit using the design wizard to replace text, add pictures, and edit interactivity, with automatic updates of page previews. TigerInsight provides users with real-time insight into who is engaging with their content. The reporting system records all page views and clicks, survey results, time spent on page, and more, with the option of tracking visitors by employee number or email address. Interactive elements, such as polls, quizzes, and surveys, can turn content into an eLearning experience, with scores automatically recorded and the ability to link modules to create a course progression. A comprehensive product that I can build to my own design and upload my own content when I need to. this program has allowed my business to improve our training capabilities and is great value for money. The support from the team has been invaluable.I like that you don't have to be a software developer to essentially build your own platform. I like that this software is flexible and works with other functional programs such a e-sign documents and has allowed me to build our first online training platform. This software has made it easy to publish work online and create to the naked eye a website that not only looks smart but that we can edit as and when we need to without incurring any additional cost. The software is very easy to use and I can keep publications in one area making it easy to add more issues and also report back to my company on views and interactions. I like that I can track every user if I want to via their employee number which is essential to a training site. I like that there is options for template designs, meaning you don't have to be a designer to create a great looking platform and that the page team offer design help when you need it. I also like I can export reports to excel and that I can dive into the detail of clicks and interactions. I like that you don't have to be a software developer to essentially build your own platform. I like that this software is flexible and works with other functional programs such a e-sign documents and has allowed me to build our first online training platform. This software has made it easy to publish work online and create to the naked eye a website that not only looks smart but that we can edit as and when we need to without incurring any additional cost. The software is very easy to use and I can keep publications in one area making it easy to add more issues and also report back to my company on views and interactions. I like that I can track every user if I want to via their employee number which is essential to a training site. I like that there is options for template designs, meaning you don't have to be a designer to create a great looking platform and that the page team offer design help when you need it. I also like I can export reports to excel and that I can dive into the detail of clicks and interactions. I think that the design elements are limited due to having to upload artwork, however this is easy for people not used to designing. I think that the reporting interface is complicated and it could be made simpler, however having said that I can now use the platform confidently after a few months. Thank you for finding the time to submit such a glowing review. It's simply fantastic to hear how positive you are about PageTiger and the many ways it has assisted in your role at CPM. Long may it continue! Thank you also for feeding back on the reporting interface. We are currently working on improvements here, so hopefully you will see some new features in 2019. 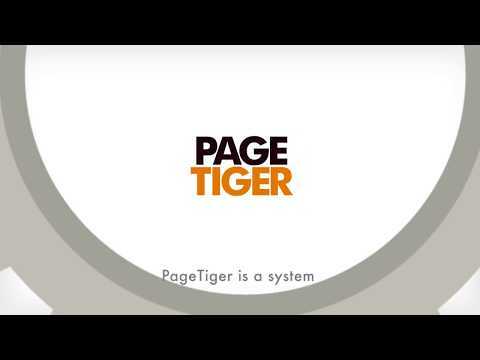 What got my immediate attention was the capability to produce great looking documents that an audience can interact with, but what I like most is not the software itself, its the fantastic support services provided by the Page Tiger team. Their software is great, but their customer service is first class. Even if a competitor could bring a product to market with a few extra bells and whistles (which I don't think they will) unless they could beat the service I have received from the team I wouldn't be going anywhere else. I am probably working at the edges of the software's capability, so anything I find I don't like about it, most customers probably haven't even discovered yet. Rather than "like least", It's more of a case of what I'd like more of. The guys at Page Tiger know what they are and they are usually pretty good at making them happen. Thank you for for taking the time to review PageTiger and for all your support over the past few years. We are thrilled not only with your comments, but with all the incredibly useful feedback you have given us. You are such a fantastic advocate for PageTiger! Thank you too for mentioning our team. After our product our people are our greatest strength, so it's wonderful to hear this. I really enjoy that the design and interactivity features are now both in the same place. It makes using the software more efficient and takes less time to create new publications. I think the reporting could be more specific to each client and the needs they may have. We use employee number, but having to type in the number and then the 'fake' email address in the search bar just adds more work. It would be great if the search bar could search for anything within the employee number, not just exact. Ability to change the name of a publication group, we created one, but during the design the name changed. You do not have the ability to change the publication group name at this time. The navigation has improved, but I feel there are still improvements to be made. For example, when I go into an issue to see a report, when I hit back it brings into an area with graphs, but I have to go back to the home page to get into a different issue within the publication. Thank you for taking the time to review PageTiger and for such a positive response. We're so glad to hear you're enjoying using our software and that you find it good value for money. Thank you for the valid feedback on our reporting tool. We are working on improvements here to make our analytics even more insightful. We will keep you posted! Finally, we do hope you continue to enjoy using PageTiger. I absolutely love Pagetiger and it one of the best tools I have ever worked with. Most of it is so easy to handle, even without any design background you can do stunning pieces. I don't even know where to start with all the positive. More important is my comment in the Cons field, where I have feedback regarding resource management. The only thing that definitely needs to be improved is the resource management (especially images) for interactive windows. The upload is not the problem, but when you use loads of images in one Pagetiger, the list of images gets very long, the images don't follow any order and you always have to copy/paste the link when you want to implement into your design. I used over 50 images in my last issue and it was a nightmare to go through the list all the time to find the image I needed. The edit field for additional information boxes e.g. don't follow any logic when it comes to formatting and are really troublesome. So this is the only area where I see huge room for improvement and I hope that Pagetiger will do something about it to make users' lives easier. Thank you for taking the time to review PageTiger and for such superb feedback! Our customers are at the heart of everything we do, so we really do value your feedback about the resource manager and the editor in the more information module. Have you seen our new shortcut for copying and pasting from the resource manager (the small rectangular icon next to each URL)? Also, please don't forget the very helpful user guide (under the 'help' button in the toolbar at the top of your account) and our online support. We will most definitely take your feedback on board and hope you continue to have such a great experience of using PageTiger. PageTiger is an excellent value. So easy to use and the end product is professional and beautiful. The ease at which we can create a beautifully branded, interactive, electronic document is amazing. We use PageTiger in our onboarding process allowing us to present a lot of information to new hires in a organized, professional, high-quality manner that is easy for the new joiner to use. There is so much flexibility in the design that we are branching out and using it for corporate updates to all employees. The way in which information is presented using PageTiger is so inviting and easy to use. It looks like we had a team of designers spending weeks to put these documents together and in reality it only takes one person a day or two to put it all together. There is nothing that I don't like about PageTiger. It is easy to use, it is inexpensive, it produces the highest quality documents. There is nothing not to like. Thank you for taking the time to review PageTiger and for such glowing feedback. It's absolutely wonderful to hear. We're thrilled to hear you're having such a fantastic experience of using our software for your new starter content. Long may it continue! Author and Administrator accounts are charged as an annual subscription. PageTiger offers a selection of pre-built TigerPacks, or users can create their own bespoke quote. With PageTiger, users can create, publish, and track interactive content, lock content to brand guidelines, control access to documents, edit or hide shared documents, and more. PageTiger includes a selection of ready-made templates set to match brand guidelines, to which users can add their own words, images, and videos, and interactive elements including links, tests, surveys, and downloads, and embedded content from intranets or websites. Created content can be saved as TigerKits, which bundles all elements of a publication into a customizable kit, with users able to lock parts of the kit before they are passed to authors to ensure brand consistency. All page views and clicks are automatically recorded, enabling the monitoring in real-time of reader engagement, time spent reading each piece of content, survey results, and more. Polls, surveys, and quizzes can be included in content, with scoring and pass mark recording allowing users to reward colleagues for high scores with personalized certificates and custom badges. Below are some frequently asked questions for PageTiger. Q. What type of pricing plans does PageTiger offer? Q. Who are the typical users of PageTiger? Q. What languages does PageTiger support? Q. Does PageTiger support mobile devices? Q. Does PageTiger offer an API? No, PageTiger does not have an API available. Q. What other apps does PageTiger integrate with? Q. What level of support does PageTiger offer? Didn't find what you came for?